I'm not sure what took me so long to finally blog my recipe for Cha Ca Thang Long (Vietnamese Hanoi-Style Turmeric Fish with Dill). I like to think that I was trying to perfect it as I've made this numerous times before settling on this version. The recipe and restaurant recommendation requests from family and friends motivated me to start the blog, but this dish was how I discovered food blogs in the first place as I searched for a recipe. It wasn't that I was feeling particularly nostalgic for Hanoi as much as I was thinking of that summer in general. As I said, I didn't really get into this dish until I ate at the famous Cha Ca La Vong in Hanoi. I had eaten it before in America, but eating cha ca at the restaurant that invented the dish more than a century ago, which is so famous that the street is named after the dish, was a whole 'nother experience. Sure it cost 10 times more than what I normally paid for a meal in Vietnam, but some things needed to be experienced. Even if it's just once. 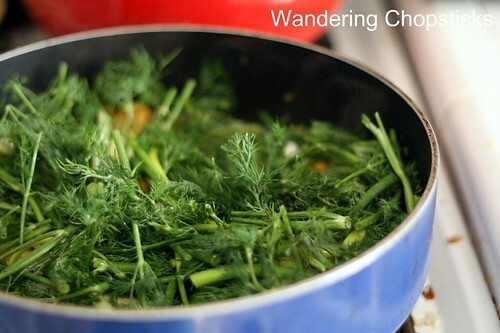 Cooking with dill is a uniquely Northern Vietnamese ingredient. 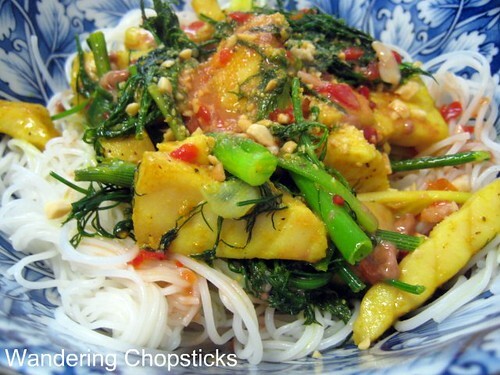 The unfamiliarity of this herb to most Vietnamese makes this dish less popular than it could be. It was hard for me to disassociate dill from pickles, but once I did, it became a lovely foil for fish. Sure I've had dill with salmon, but dill in Vietnamese cooking, especially in such copious amounts, was a new one for me. Since that long ago day, I've tried to recreate the recipe many times, tweaking ingredients here or there. I've settled on sturgeon as the perfect fish for this as it closely resembles the taste and texture of ca loc (Vietnamese snakehead fish). Restaurants in Little Saigon have substituted with catfish or tilapia, but those fish are softer and tend to fall apart more. Obviously, go with whichever white fish you can find, but firmer is best. 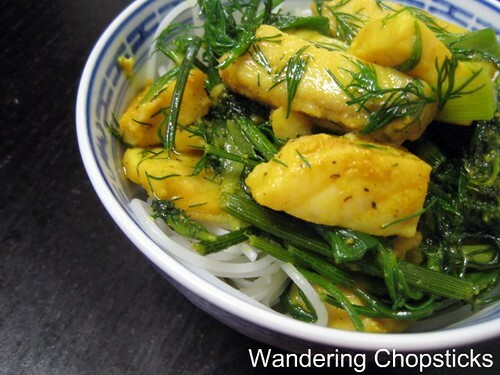 I tried to make it healthier with less oil, but at Cha Ca La Vong, the pan easily had an inch of oil and once the turmeric fish and dill hit the sizzling oil, it released the most tantalizing fragrance. Dill is used generously in this dish. Treat it like a vegetable, not a garnish. The restaurants here seem to have toned down that aspect and the less oil and dill as a garnish just didn't satisfy me. Lastly, I'm not a fan of galangal. After several attempts at incorporating it into the recipe, I just decided to omit and am much happier for it. 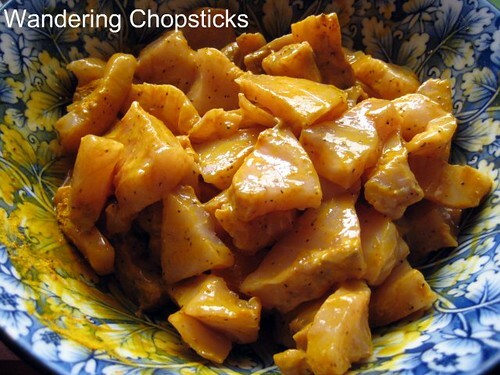 I use grated ginger and its juice, and that settles much better with my palate. Substitute as you see fit. And I'm serious about the oil. Use olive oil and be generous. There's just something about how the turmeric in the fish combines with the dill, with lots of oil to release those fragrances, that really makes the dish. Obviously you can try it with less oil, but you'll come around. Trust me. Herb platter of mint, rau ram (Vietnamese coriander), tia to (Vietnamese perilla), etc. Prepare 2 lbs of sturgeon or any other firm-fleshed white fish of your choice. Cut into 1- by 2-inch pieces. Set aside. Grate a 2-inch knob of ginger. Set aside. In a bowl, add 1 tsp salt, 1 tsp Nuoc Mam (Vietnamese Fish Sauce), 1 tsp Mam Ruoc (Vietnamese Fermented Shrimp Paste), 1 tsp ground black pepper, 1 tsp sugar, and 2 tsp turmeric. 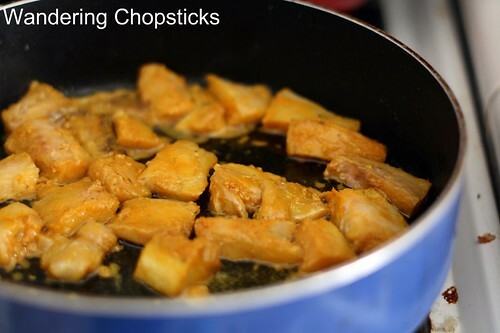 Add the grated ginger and fish, mix thoroughly to marinate. Set aside. Ooh. Look at that pretty turmeric color. 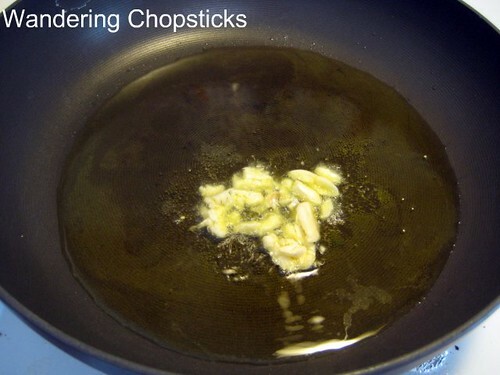 Prepare the dipping sauce by adding 1 tblsp mam ruoc, 2 cloves minced garlic, the juice of 1 large lime or small lemon, 1 chopped chili pepper or 2 tsp chili sauce, and 1 tsp sugar. Set aside. 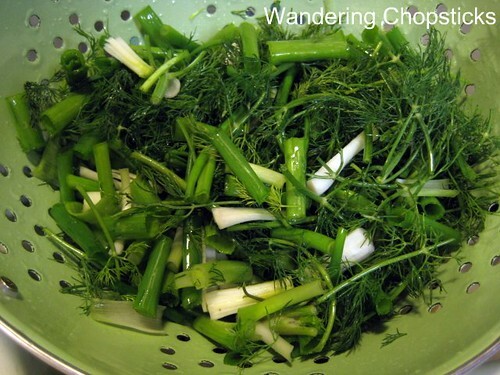 Prepare the green onions and dill by cutting them into 2-inch segments. Slice the green onions in half lengthwise at the thick white parts. Wash and set aside. Toast and lightly grind about 1/4 cup of toasted peanuts. Set aside. Boil the rice vermicelli noodles and set aside. In a large sauce pan on medium-high heat, add a generous drizzle of olive oil. Generous! Add a few cloves of smashed garlic. Toss in the fish and let them cook, flipping over halfway. When the fish looks almost done, add in the dill and green onions. Saute until the onions and dill have just softened. 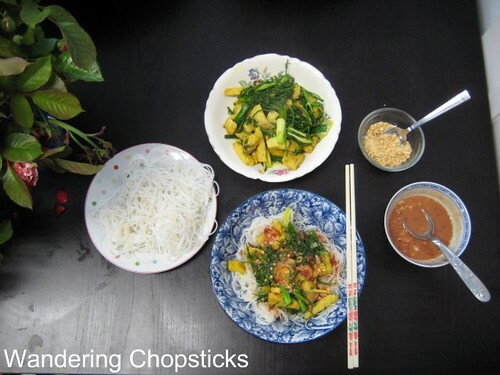 If there's more than one person, have plates and bowls of the rice noodles, crushed peanuts, and dipping sauce on hand. People can then add ingredients in whichever portion they wish. Or do the same even if you are eating for one. 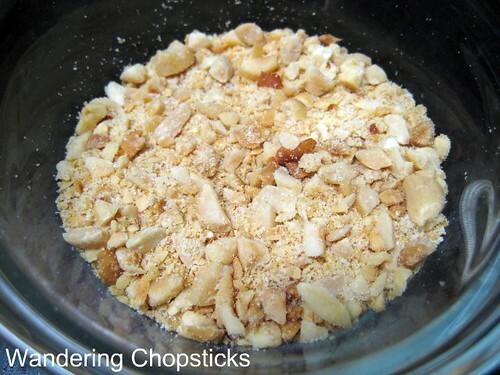 Lay the noodles in a bowl, top with the fish and dill mixture, spoon the dipping sauce and crushed peanuts on top. Who else made cha ca Thang Long? Nikki Polani used her mother's method of cooking the fish in smaller batches with less oil. 1 year ago today, borscht redux. 2 years ago today, Fried Rice with Chinese Sausage, Mixed Frozen Vegetables, and Eggs. This one has been on my to-do list for a long time. I've half a mind to go to Vietnam to eat this. Looks fabulous! Turmeric stains like crazy! I remember eating this with rice and it stained the rice. hahaha but still yummy nonetheless. As for my adventure to SGV, I'm thinking Luscious Dumpling and it's either Bamboodles, Lunasia for dim sum or Sunday Bistro (I think that is what it's called.) So hard to decide. Looks great, very much like the original dish. I've also tasted the dish at the restaurant in Hanoi and have been disappointed whenever I've had it elsewhere. Your version and instructions look very close to the real deal. 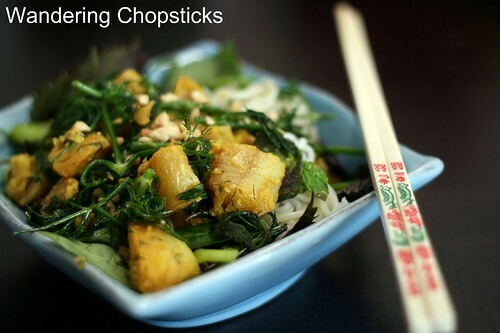 Wow, this has been on my list of things to cook since eating it at Cha Ca La Vong in Hanoi, too!! You're right that restaurants here make it into a different dish with less dill and oil and mam ruoc. Half the flavor's gone when they do that that I don't even bother trying this dish at restaurants here anymore, no matter how nostalgic I get over the dish. Your picture looks just like at that restaurant. I will have to try your recipe soon. Thank you!! I love this dish. Just as you were posting it, my mom was telling me she had just served it to some friends who were visiting. Hoping to learn a few tips, my mom asked how her friend made the dish. She said she deep fries the fish and then puts it in a crock pot... I don't think mom could bear it. You'd have to go to Vietnam, the restaurants here just don't do it right. If you hit up Luscious Dumplings, do it right when it opens. Are you sure you want to do dumplings and dumplings? I like Baccali better than Sunday Bistro. If you hit them up between 3 to 6 p.m., there's great afternoon tea specials with drink included. Turmeric, ground coriander, and cumin sounds like a fine marinade! I try. The versions here are just too muted and they use tilapia or catfish, which totally have the wrong texture. And not enough dill or shrimp paste. Exactly! Wrong fish, not enough dill, not enough mam ruoc and it's just not the same dish at all. I don't know what it is about the amount of oil, but it releases something with the combo of turmeric and dill. Let me know if you try my recipe and how it goes! i made this tonight using grouper, it was excellent. 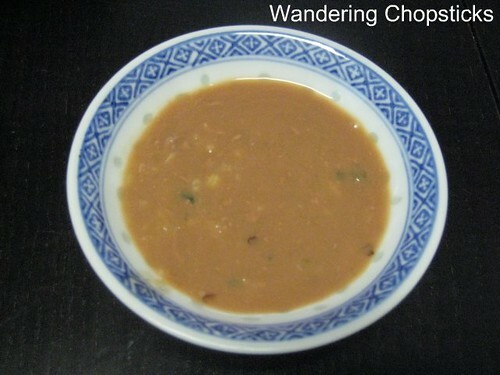 thank you for posting the recipe it is a favourite of mine every since i tried it at a vietnamese restaurant in toronto. hope to be able to try it in hanoi someday. Lovely! It's always great to hear when a recipe turns out well. hi! i just used your recipe last night and it turned out great! the cha ca in hanoi is indeed difficult to replicate, but your version is quite nice. i also made canh chua ca for a dinner party a couple weeks ago using your recipe as a guide, and it was loved by everyone! so thanks and i'll be exploring more of your recipes in the coming weeks for sure! Oh lovely! Thanks for letting me know. I'm glad everyone liked both recipes. Reminds me I've been meaning to make this again as my sister-in-law loves it. I finally got around to making this last week and it was spectacular! A new favorite. Thanks for testing the recipe so carefully. Thanks for letting me know! I love hearing when someone tries my recipe and likes it. My boyfriend and I used to live in Viet Nam and since we've been home we've tried various cha ca recipes. They've always been good, but not quite right so I've kept looking. So glad that I eventually found yours - it's the best! We both LOVED it and raved about it to all of our friends. Our search for cha ca recipes is over! Thanks so much! Yay! Aww, I love it when I hear people say they tried other recipes and my version is best! Who doesn't love hearing that? :) So glad you and your boyfriend liked it. I stumbled across this recipe randomly one day and decided to make it...well, it has since become my boyfriend's favorite dish EVER (I love it too!) and I probably make it every other week. Thank you for introducing non-Vietnamese people to this amazing cuisine! Thank you so much for trying a random recipe. What a nice compliment! So glad you two like it so much. And make it so often?! Every time I visit Hanoi I make a point of going to Cha Ca Thang Long restaurant. Just tried your recipe and it's very nearly as good as the original. Only thing missing is the rickety stairs and creaky floorboards. 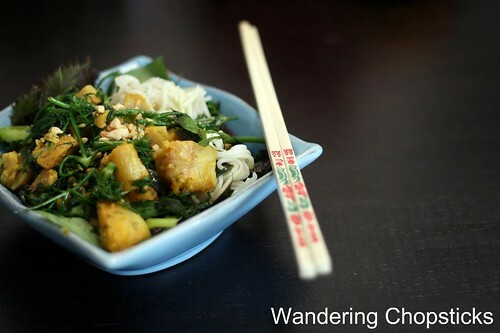 I ate Cha Ca Thang Long for the first time a couple of weeks ago, at a wonderful tiny restaurant in Orlando, FL. 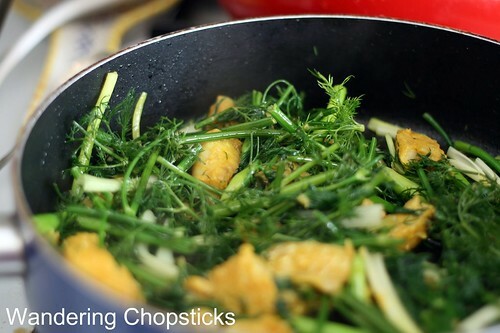 The cook used tilapia and added PLENTY of dill, like you recommend, but also topped the fish with several slices of fried Vietnamese fish cake. It was delicious, but I've never seen a recipe that includes it. Have you ever heard of this? Sounds like the restaurant combined Northern and Southern Vietnamese versions of cha ca. Cha means paste; ca means fish. For Southerners, cha ca is the fish cake you ate. Mostly made into one large fish cake and then thinly sliced. In Vietnam, and even here, this style, cha ca Thang Long hasn't been as popular. The few restaurants that serve it tend to stay more with the traditional preparation, but there's no reason why Southern-style cha ca can't be added as well. Sounds like a great idea to me! Hi how many does the recipe serve? Thank you! It makes about 4 to 6 servings. Usually I include that info. Thanks for pointing out the omission. I'll update.